If your home frequently loses electricity during storms, consider having a battery operated sump pump installed in your basement. With a sump pump fitted with a battery backup system, even when the power fails, you don't need to worry about water damaging your home. 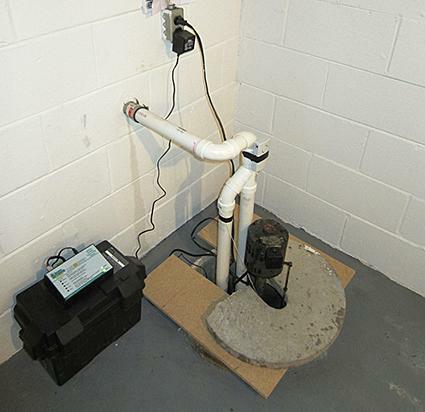 Battery backup sump pumps work identically to regular sump pumps when your power is on and functioning. When water enters the sump pit, it trips a switch in the pump, which sends the water up and out of your home. The difference is that a battery backup pump will function even when there is a loss of power. When the power is off, the pump automatically switches to its backup system, so there is no lag in water removal. So a large storm that takes down power lines and leaves you without power will have no effect on whether or not your pump continues to function. Not everyone would truly benefit from having a battery backup system, which can cost significantly more than a standard sump pump. Consider getting a battery system if you fall into one of these categories. If your home or yard is below the water table and your pump works nearly every time there is a storm, it's a good idea to have battery backup. Even if you only lose power infrequently, the fact that you rely heavily on a pump makes a backup system worthwhile. If you live in a rural area, a heavily wooded area or an area that is prone to frequent power outages, a backup battery sump pump can be beneficial, even if you only need the pump once in a while. Because power outages are more likely to happen during storms or heavy rainfall, a battery backup system can give you peace of mind. Just like regular sump pumps, battery pumps come in a wide range of choices, from high capacity to those that will also pump out sewage in case of a septic failure. Be sure to measure the size of your sump pit and take into consideration how often the pump will be used, both with electricity and without before you buy. PHCC Pro Series: This large capacity sump pump with battery backup can also handle sewage and up to 4000 gallons of water per hour. Basement Watchdog Emergency Battery Sump Pump: A large capacity pump meant to work in emergency conditions, it pumps up to 2000 gallons of water an hour. Hydropump RH1400 Battery Powered Backup Sump Pump: This heavy duty pump can mount on the floor or wall near the sump. PHCC PRO SERIES Sump/Battery Backup System, 6.5Amp Backup: This is a two piece system that mounts partly in and partly out of the sump. PHCC Pro Series 2400 Battery Backup Sump Pump System: Two batteries, each with 16 hours of use, are included. A sump pump with a battery backup can mean the difference between getting through a storm with your home intact, and emerging with flood or water damage. Consider replacing your standard sump pump with a battery backup model during your next renovation to help ensure its long life.